Another bright, summertime, weeknight meal in less than 30 minutes that was beautifully delicate yet full of flavor. Rachael Ray eat your heart out as this meal is pretty to look at, unbelievably tasty and you don’t have to choreograph your every move to prepare this meal in 30 minutes. I wish I had a cute story to tell about this dish but I don’t. I wanted scallops for dinner so we went to our local market and bought these gorgeous scallops. It would have been nice to get diver scallops but let’s be real. We live in Dallas and you just don’t see diver scallops very often. 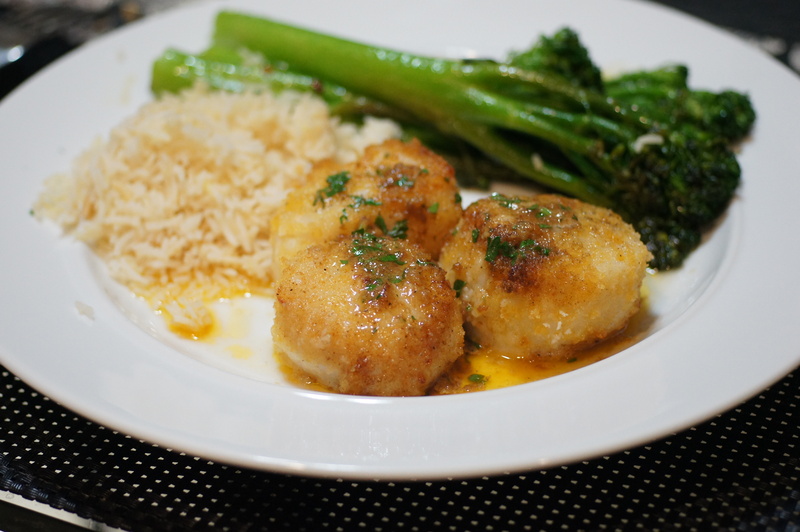 These sea scallops would just have to do and they did. 🙂 While we were at the market Baby Lady saw some nice broccolini so she bought it as the vegetable. This is what we did. OK. We made this with rice, so the first thing to start is the rice, however you like to cook it. By the time you prep and cook everything, the rice will be ready. We use a rice cooker because it’s easy and works like a charm. Sorry folks, no photos because things get moving pretty quick with this dish. I was lucky to get time to take the few shots of the scallops. Heat olive oil in a large, heavy bottom skillet. Add crushed red pepper flakes and sliced garlic. Cook over medium heat until garlic is golden brown but not burnt, roughly 4 – 5 minutes. Remove garlic from oil and reserve. Put broccolini in skillet and cook over medium heat for 5 minutes (depending upon size and desired tenderness). Turn broccolini and cook on other side and cook another 5 minutes. Place lid on skillet, remove from heat and allow to sit for 5 minutes. 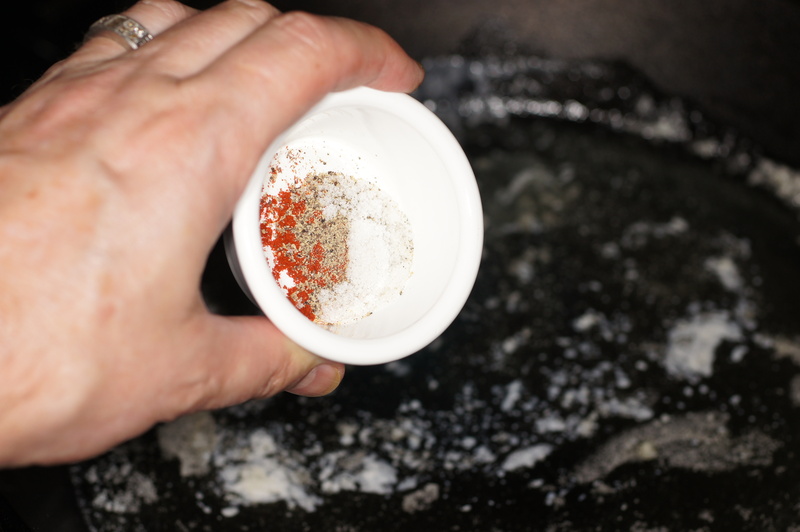 Return reserved garlic to skillet and add salt and pepper to taste. Toss to combine. 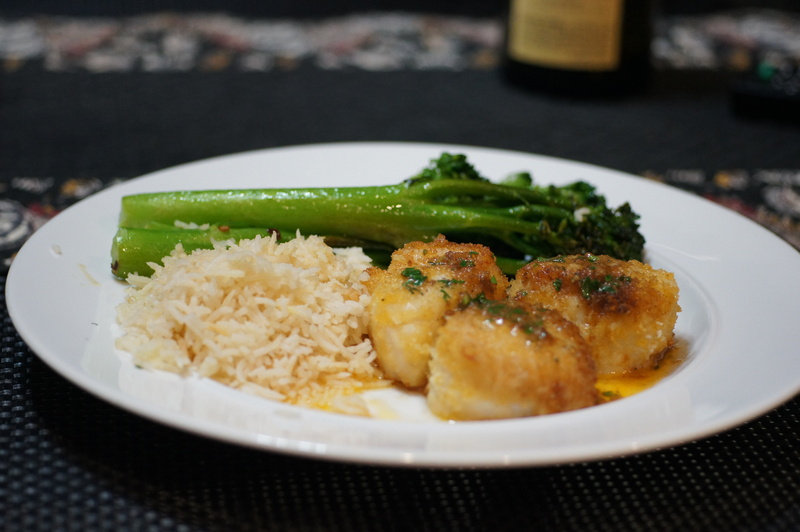 When you put the garlic in the skillet for the broccolini, start the scallops. 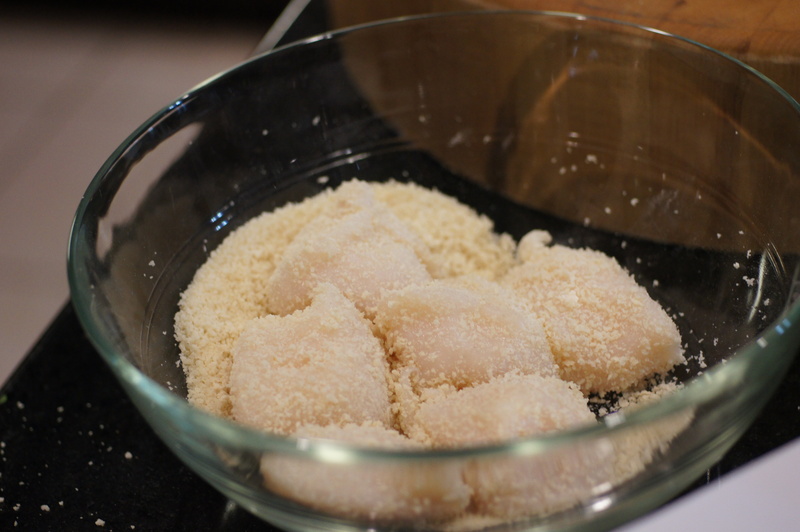 Pat dry the scallops completely and roll in bread crumbs. We had some panko that I put in the food processor to make the breadcrumbs for this dish. Melt half of butter in skillet over medium low heat. Add salt, pepper, and paprika. Add scallops and sauté slowly for 7 to 9 minutes, or until golden brown. Turn to brown evenly. Remove scallops to heated serving dish and keep hot. 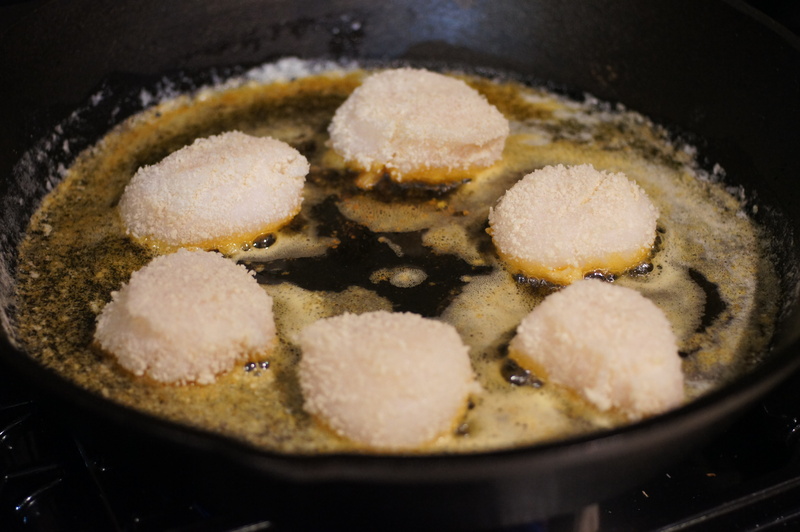 Put remaining butter, parsley, and lemon juice in skillet; heat and pour over scallops. Everything looks perfect and delicious! Thanks for dropping by and your very nice compliment. It was a very enjoyable meal. We’re glad you liked it. 🙂 The broccolini is all Baby Lady. She loves using garlic scented oil and started using this technique several years ago after watch Lydia Bastianich do it. And this is why I love Lidia. Many of her techniques, the little things, are the same as those that the women in my family have always done. No scallops in Wyoming but you should be able to get lots of fresh trout. 🙂 There is some great fly fishing where you are headed. Looking forward to that (not to the fly fishing but to the fresh trout). Trout is great on a grill or wrapped in foil. Thanks for the suggestion, I’ll watch out for that. I love scallops. I had them a few days ago – just a little butter and a little lemon juice. I didn’t want to detract from the flavor. I had mine with broccoli rabe.